Anchorman 2: The Legend Continues hits theaters on December 20, and the campaign to get Ron Burgundy back in the spotlight has already reached a fever pitch. He’s been selling a whole lot of Dodge Durangos, got his own Ben & Jerry’s flavor, and will return to Conan to pimp his memoir. 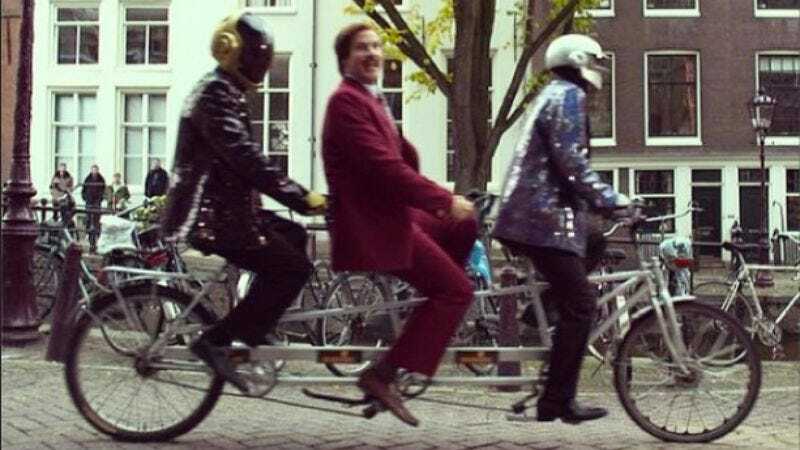 Last night, Will Ferrell appeared as Burgundy throughout the MTV European Music Awards in Amsterdam, or as he called it, “the city of culture, miller of winds, cobbler of clogs.” He took a tour of the city, where he met up with Daft Punk, a rendezvous that eventually resulted in the '70s anchorman and the robot musicians riding on a three-person bicycle “like a human centipede.” And later, Eminem accepted his award from Burgundy and played right along, going full Brick Tamland in his speech: “I love award. I love award.” There is no possible way anyone will get tired of Ron Burgundy oversaturation in the next month.